As someone who fell hard for sustainable roses, I have avoided hybrid tea roses like the plague. I thought they were tiresome prima donnas in the garden that looked pretty, had lost their scent, and required a regular drenching of chemicals in order to survive—and I was wrong. Last winter a rosarian strongly recommended a hybrid tea, ‘Dark Desire’, which she claimed had behaved superlatively in her South Carolina garden with no spraying. I then read about ‘Beverly’, a hybrid tea whose name was apparently on everyone’s lips. 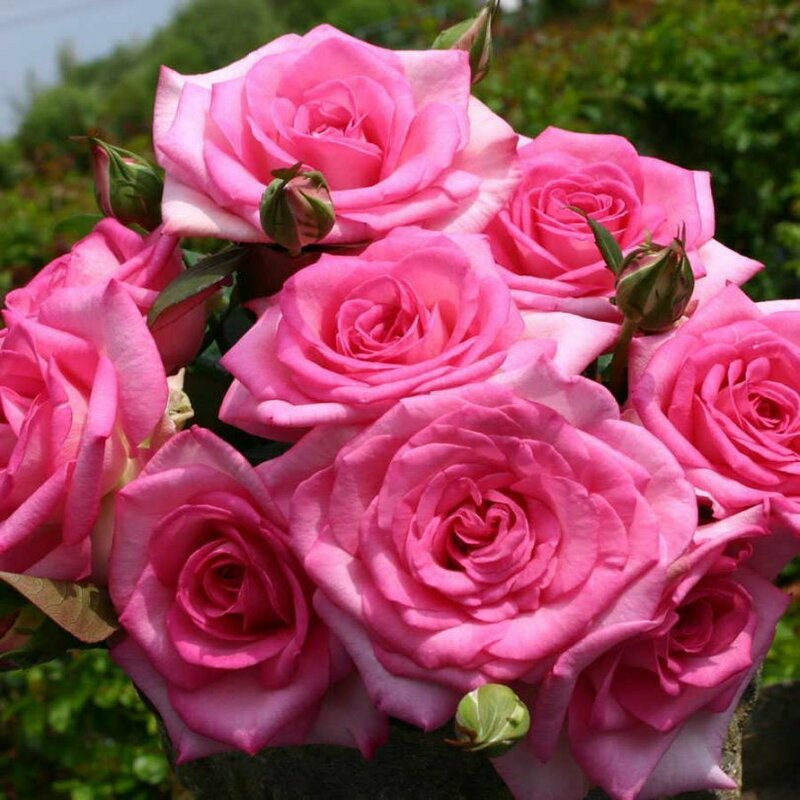 Consequently, when I placed my spring order of roses, both ‘Beverly’ and ‘Dark Desire’ were on the list along with ‘Plum Perfect’, ‘Savannah’, and ‘Wedding Bells’. When they arrived, I couldn’t believe that I was planting five hybrid teas. What, I asked myself, was going on in the world of sustainable roses? The roses started to grow immediately—something I appreciate as many shrub roses will take one or two growing seasons before they deign to grow a new leaf. These hybrid teas began producing flowers quite quickly and three months later there was no blackspot on any of them. The green and glossy foliage and their shape are equally attractive. They all have something in common: they all are incredibly fragrant, with the exception of ‘Plum Perfect’. These hybrid teas have come out of the breeding program pursued by Kordes Rosen of Germany. In the 1990s, at a time Germany was going green, Kordes set about developing hybrid tea roses that could survive on their own roots and would require no chemical spraying. I had become a fan of their shrub roses, especially of their Fairy Tale line, but had been reluctant to try their hybrid teas. There are many good reasons to buy own-root roses. Their lifespan is longer and it’s pretty hard to prune to death an own-root rose. There is little chance of getting a rose infected with rose mosaic disease as it’s transferred by infected rootstock. And root suckering is not a problem as own-root roses use their own canes, not those of a different rose as in the case with grafted roses. As with all roses, hybrid teas require a regular supply of water and a regular schedule of fertilizing—roses really are heavy feeders if they are to perform to their potential. Unlike some shrub roses, these hybrid teas don’t reach a large size. They will require some pruning in mid-to-late February but are remarkably carefree for a rose. Because I work on the theory that if four hybrid teas make me happy, more will make me even happier, I have begun to compile my list of new cultivars to plant this fall: ‘Pink Enchantment’, Fiji Eleganza Rose, and ‘Heart Song’. All are Kordes hybrid teas. Because I danced cheek to cheek in 1954 to the song “Earth Angel,” I couldn’t resist ordering ‘Earth Angel’, a Kordes shrub rose. Of course, now I shall have to determine where I shall put them in my full garden but these roses are too perfect to miss out on. Alas, they are still deer candy. Sorry about that.